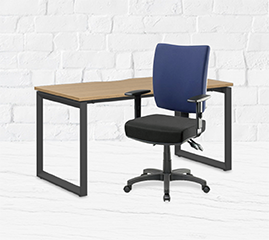 From a full consultation service to a bulk furniture order, at Officeworks, we can help fit-out your office for less. We offer three different fit-out services for all kinds of businesses and spaces. Explore them now and get in touch with our team of experts to see how we can help. From planning to installation, our complete consultation service offers cost effective, fast and easy office fit-out solutions. “I was really happy with the way our studio fit-out turned out. They listened to what we wanted and knew how to make the most of the space we had”. Whether you need 10 chairs or 100, our dedicated team will work with you to find the right furniture, from our off-range and bulk selections. “They actually have more business furniture than you see in their stores and online. I found everything we needed at a fraction the price we’d been paying at our local furniture showroom”. We offer an on-going furniture ordering and sourcing service for building and construction companies. “I didn’t know Officeworks had an expanded range of business furniture suitable for Design & Construct and Architectural Projects”. You’ll be surprised at the wide range of furniture options we have suitable for any sized space. Checkpoint Systems, a global leader in merchandise availability solutions required a complete business furniture refurbishment for both their Melbourne and Sydney offices. Officeworks helped define Checkpoint’s requirements through a number of collaborative and consultative meetings resulting in a contemporary and functional office fit-out. Wesfarmers planned to consolidate their Perth operations across three floors of the new Brookfield Place Tower 2. Their new floors were bare so required a complete fit-out. It comprised an expansive reception area, a boardroom and dining suite, a kitchen, multipurpose meeting and function spaces, executive offices and lounges, plus open-plan collaborative working zones. The company was moving into empty premises, so needed a complete workspace fit-out, including call centre area, administration, boardroom and sit stand desks. The project commenced over the busy Christmas period while PBX’s directors were in China, plus PBX had specific colour, style and functionality requirements. With a planned move into a renovated shop in the Brandon Park shopping centre, Doctors at Brandon Park needed furniture for their new practice. Having been impressed with a recent Ofﬁceworks ﬁt-out at Vermont Consulting Suites, they asked us to provide some furniture options to suit their new space. Located within a brand new purpose-built medical centre, Vermont Consulting Suites requested Officeworks to create a warm and inviting feel across the reception and waiting areas, and the 10 consulting suites. Hear and Say is a not-for-profit organisation whose mission is to enable all children who are deaf to hear, listen and speak so they can attend regular school, have wider career choices and can more fully participate in their community. Hear and Say provides a range of services and programs to over 2000 children, students, young adults and families. We were approached to help fit-out Hear and Say's brand new space with commercial-grade task chairs for all staff, as well as a boardroom table that would fit comfortably into a challenging space. DB Schenker is a premier provider of integrated logistics services, and needed to provide a warm and welcoming environment to its customers and staff alike. Part of our specific requirement was to ensure that tight timeframes were met for installation and delivery to coincide with the building construction. Techforce is a niche recruitment group with 25 years' experience supplying specialist staff to a range of Australian businesses in the mining, manufacturing and health care sectors. Outgrowing their serviced office in Western Australia, Techforce approached us to help them upgrade to a larger space. Techforce needed an open space to allow their 8 staff to work collaboratively, along with spaces for private meetings and interviews. A key consideration was to develop a solution that would allow growth and the ability to add to as the business expands. At Officeworks, we pride ourselves on our extensive range of furniture solutions for all kinds of office fit-out solutions. We know that your office space reflects not just the work your do, but your relationship with your customers and clients too. From small fit-outs to complete office upgrades, our team can help you plan, design and install any new space.